Whilst I find Bill Bryson amusing, his, possibly contrived, whimsey would probably get on my nerves if I read too much of him. I have never read A Walk in the Woods: Rediscovering America on the Appalachian Trail , but I have sometimes thought how it must be to walk it. During my Camino to Santiago de Compostela I walked for some days with a guy who had done it three times; he was all at once a loner but at the same time he craved company. I guess that you really do have to be a loner to walk all 2,200 miles of the Appalachian Trail. 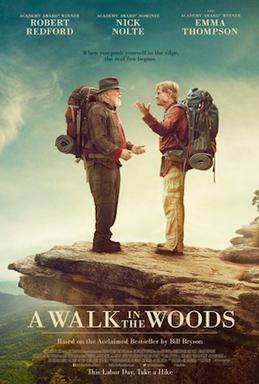 I thought that you might find this article interesting, and it may whet your appetite for watching the movie of the book (walking movies are all the rage) which stars Robert Redford and Nick Nolte, due for release 2 September. When I was eighteen, I bought a copy of Bill Bryson’s A Walk in the Woods: Rediscovering America on the Appalachian Trail which remains, if my conversations with strangers are any indication, the only book anyone has ever read about the Appalachian Trail. It was summer. My friend Andy and I had driven across the country and ended up in the town of Sheridan, Wyoming, where we stayed for a week with a genial middle-aged couple, family friends of my friend. Scanning my hosts’ bookshelves, as I have a tendency to do, I was quietly horrified to discover that they were exclusively stocked with works of pop evangelicalism (Rick Warren and the like). It was a literary desert: xeric, Mosaic. Bryson’s book was the only one I’d brought, so, while Andy rode dirt bikes with a guy named Dusty, I lay on a fold-out couch in the basement, consuming it in controlled bursts, as if bolting food rations. There, in that basement, I resolved that one day I would hike the trail the right way: from end to end, in one continuous trip—what’s often called a “thru-hike,” always with that peculiar, abridged spelling, otherwise reserved for fast-food signage and nineteenth-century poetry. Bryson thus finds himself in the curious position of being both the outward face of the Appalachian Trail and its most inwardly mocked figure. This discrepancy will likely intensify when the film version of the book, starring Robert Redford and Nick Nolte, premières on September 2nd. I gather that some people who have thru-hiked the Pacific Crest Trail feel similarly about “Wild,” Cheryl Strayed’s best-selling hiking-memoir-turned-feature-film about hiking one third of the P.C.T. There is also the curious case of Paulo Coelho, the author of, among other books, “The Pilgrimage,” a best-selling account of walking the Camino de Santiago de Compostela, the famed network of pilgrimage routes across Spain (and beyond). Coelho quit in the town of O Cebreiro, some hundred miles short of his destination, and then rode in a bus to Santiago de Compostela. According to a profile of Coelho published in this magazine in 2007, the proprietor of a hotel along the Camino told Coelho that his book had done wonders for his business. “As Hemingway was for San Fermín, you are for the pilgrimage!” he exclaimed. In the end, as at the beginning, I found “A Walk in the Woods: Rediscovering America on the Appalachian Trail to be a delightful little book. Still, I don’t care what anybody, including the author, says: Bill Bryson did not hike the Appalachian Trail. This entry was posted in Uncategorized and tagged A Walk in the Woods, Bill Bryson, Nick Nolte, Robert Redford on August 23, 2015 by proverbs6to10. Well, Hilaire Belloc caught the train from Como to Milan in The Path to Rome. I can’t imagine reading that chiefly for the hiking bits, but when it is good (not everywhere) it is far beyond what Bryson can do. For the rest, Bryson set out to write an amusing book for a general audience. Had he set out to through-hike the trail and record it soberly, he would have spent three or four times as long in the woods to satisfy an audience a fraction of a percentage as large. The bogus travel memoir goes way back. Stendahl’s Roman Journal gives a lively account of Rome over a stretch of weeks when he was in Paris. Chateaubriand’s account of his American travels is at least doubted by the scholars. And I’m sure that somebody better read could give many more examples. Not read the Appalachian Trail book, but I did get a bit irritated with Bryson’s book on the history of the world, which was not his best piece of writing and was not engaging. And don’t get me started on how much I dislike Paolo Coelho, or we will be here all day. I recall in an interview with either Harry Bucknall or Nick Hunt talking of this book. I tried to get an old original copy but found it hard to find. I didn’t want an abridged, softened for new readers copy – the one that seems to be doing the rounds – the one with the Hollywood cover. I wanted the old one. I have probably picked it up in dozens of charity shops and discarded it. A very good piece – thanks for posting it. I am looking forward to the movie, although it’s been a while since I read the book; I remember being annoyed by Bryson claiming that he walked the whole thing when he obviously didn’t.